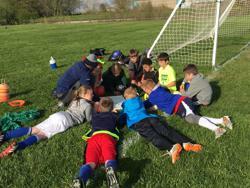 Eastern Illinois FC takes pride in providing each of its players with the best quality coaching it can find in the East-Central Illinois area. Coaches range from parents and volunteers to paid staff. All coaches are background-checked and verified. No matter what level of experience our coaches may have to begin with, each member of our staff are given the chance to learn, interact, and evolve their coaching methodology in conjunction with the EIFC Player Development Philosophy and model. Our staff regularly meets and communicates in the effort to further our knowledge and application of game concepts. In addition to clinics and coaching seminars, our coaches are provided with a binder that details our core curriculum and values. All head coaches are paid for their time and hard work spent with the kids. In addition, all coaching activities count as hours for volunteer work and efforts. Most importantly - by spending time working with and getting to know our players and families, coaches end up building meaningful and lifelong relationships. Our coaches know that even though we teach the players, the players often teach us just as much!